1998 Calgary Cannons Cap - Fresh Fitted Friday!!!! Are you a U.S. citizen who has recently been considering a move to Canada? Perhaps a single-payer healthcare system appeals to you? Maybe you are intrigued that their nation's leader has actual political experience as opposed to simply being a crass reality TV star who inherited a real estate business from his father? Either way, no judgement! Keep in mind, as a baseball fan in Canada you probably will not attend many live games. The Toronto Blue Jays are an option but what if you are moving to a western province? If your new home is in British Columbia, consider yourself lucky since the only minor league team in Canada affiliated with Major League Baseball is the Vancouver Canadians. If you don't live in Toronto or Vancouver, independent leagues like the Can-Am League and the American Association have teams representing cities such as Ottawa, Quebec City and Winnipeg. Of course, Montreal is still in serious need of a professional team but so are Canada's 4th and 5th most populous cities: Calgary and Edmonton, respectively. My interest in baseball as a youth was in large part due to the presence of my hometown team, the Triple-A Norfolk Tides. During that time, the Calgary Cannons and Edmonton Trappers were also Triple-A teams and I imagine there are folks my age (and older) who have fond memories of those teams, which is why I'm featuring this Cannons cap today. The Cannons used this cap logo from 1998 until their final season in 2002. 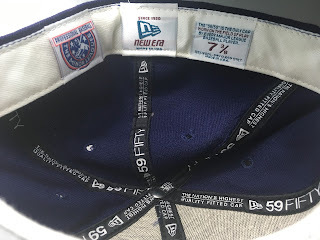 We know this cap is from 1998 because the following year is when MILB teams began featuring the New Era Flag on the wearer's left side. The New Era flag first appeared as a sweatband tag in 1997 so it's no surprise to see it here along with "The Nation's Highest Quality Fitted Cap" featured on the satin taping. Our friendly neighbors to the north proudly showcased the MILB batterman logo on their caps before, so here's hoping that they get a chance to do it again soon!